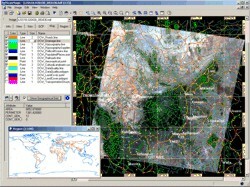 ScanMagic is an easy-to-use and powerful software for viewing, analyzing and processing remote sensing (RS) data. In most cases ScanMagic allow to create finished remote sensing products cost-effectively without involving additional software tools. The complete functionality and unique features of ScanMagic allow to process RS data in near-real time (NRT). ScanMagic utilizes efficient innovative techniques of image processing. On-the-fly spooling allow to open images of up to 4 GB in size instantly and provides analyzing that large data volume in real-time viewing mode. On-the-fly processing (for example, image re-projection on–the-fly) allow to change data processing parameters repeatedly and visual estimating of the result in real-time. Generation of value added products. Resolution Merge (Image Fusion) with Brovey, HLS and Arithmetic Transformation methods. User-defined projections, coordinate systems, ellipsoids and datums.